The Kettler Kadett Rower with special outrigger design for a circular movement simulates very closely the actual process of rowing on water. The resistance can be set accurately by means of the hydraulic cylinders, while the foot plates which are adjustable to individual leg length guarantee the best possible exercising position. When the training session is over, the outriggers can be folded inwards easily to save storage space. Experience the rush of rowing at home with the Kettler Kadett Rower. Twelve adjustment settings allow you to control resistance through two industrial strength hydraulic cylinders. The LCD training computer measures time, strokes, current and distance to ensure you meet your workout goals. An included earlobe clip electronically keeps track of your heart rate. The Kettler Kadett Rowing Machine has a special outrigger design for a circular movement which simulates very closely to the actual process of rowing on water. The resistance can be set accurately on the rower by means of the hydraulic cylinders, while the foot plates which are adjustable to individual leg length guarantee the best possible exercising position. When the training session is over, the Kettler Kadett Rowing Machine * Rower can be folded inwards easily to save storage space. 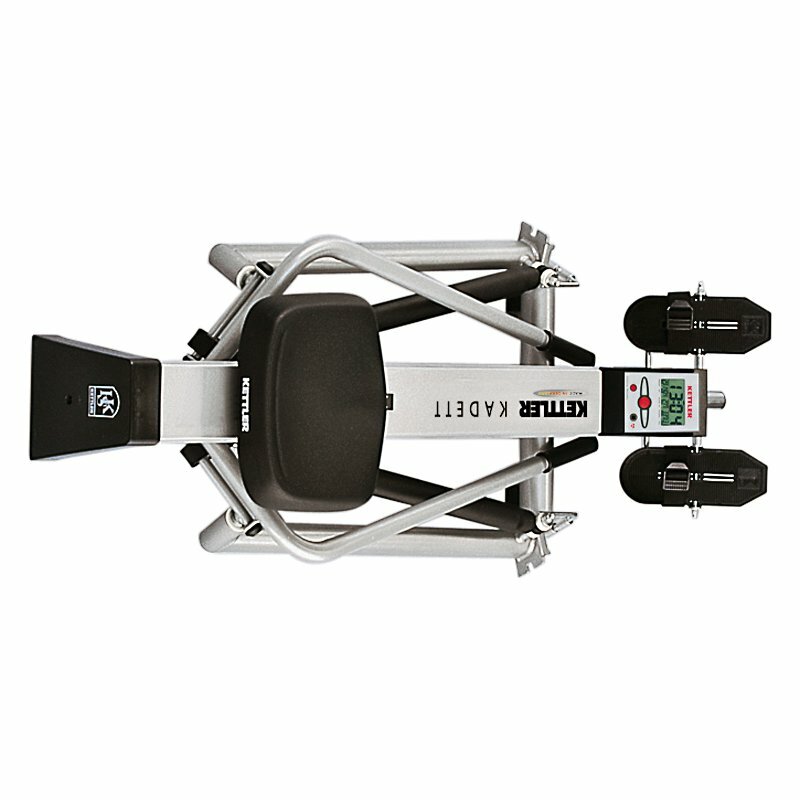 The Kettler Kadett Rowing Machine * Rower is the undisputed gold standard of piston rowing and manufacturing on an outrigger frame. 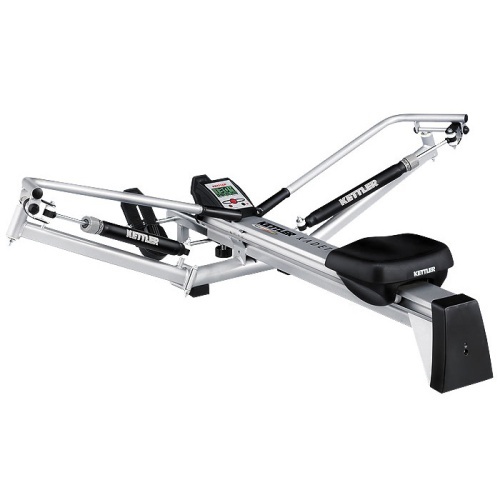 Kettler's piece-by-piece German manufacturing standards, combined with an outrigger design that works a more comprehensive set of upper-body muscles, means the Kadett provides the very best, most complete workout available in a compact rowing machine. The Kadett's frame is far more stable and smooth than those of its less expensive competitors, and its outrigger design replicates the natural elliptical arc of a true rowing motion! Like all Kettler rowers, the Kettler Kadett Rowing Machine * Rower comes with included heart rate monitoring and a performance monitor that tracks a range of workout statistics including pulse. Chat with one of our FitnessZone agents with any questions you may have about the Kettler Kadett Rower. 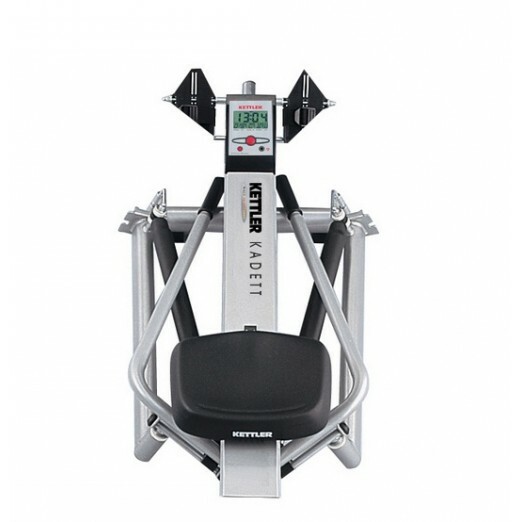 Order your Kettler Kadett Rower 7977-900 from FitnessZone.com today! Oars easily fold down for trouble-free storage. 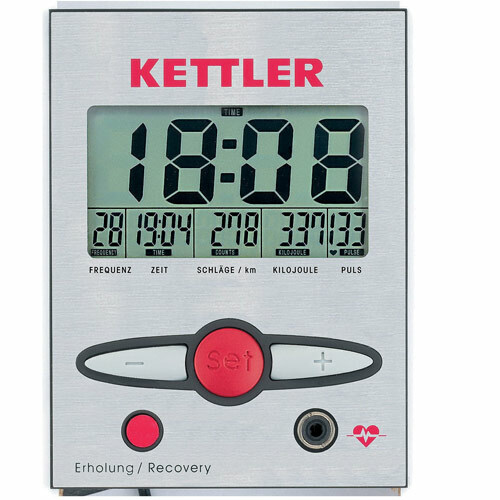 The Kettler Kadett Rower Monitor measures time, number of oar strokes, speed of strokes, distance covered during training session, total distance covered, energy consumption, and, with the pulse accessory, pulse rate. 3 Year Warranty - Kettler reserves the right to repair or replace equipment free of charge if defective in material or workmanship. Order your Kettler Kadett Rower from FitnessZone.com today!